Breathitt Secures 55th District Top Seed with 98-86 Win Over Wolfe. Fraley with 29, Taulbee with 28 to pace Bobcats to District Win. Breathitt County (12-6) traveled to Campton to take on Wolfe County (6-11) in a huge 55th District Battle tonight. The two teams are currently the top two teams in the 55th District. With the 55th District only having three teams competing in the district this year, tonight’s contest was crucial as the winner would receive a bye in the District Tournament and an automatic ticket to the 14th Regional Basketball Tournament. 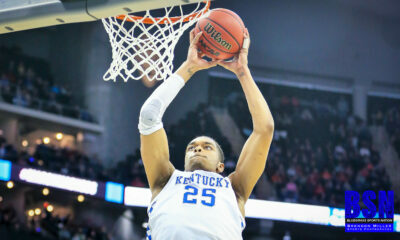 Both teams like to play a fast-paced game and rely heavily on the three-point shooting for scoring. 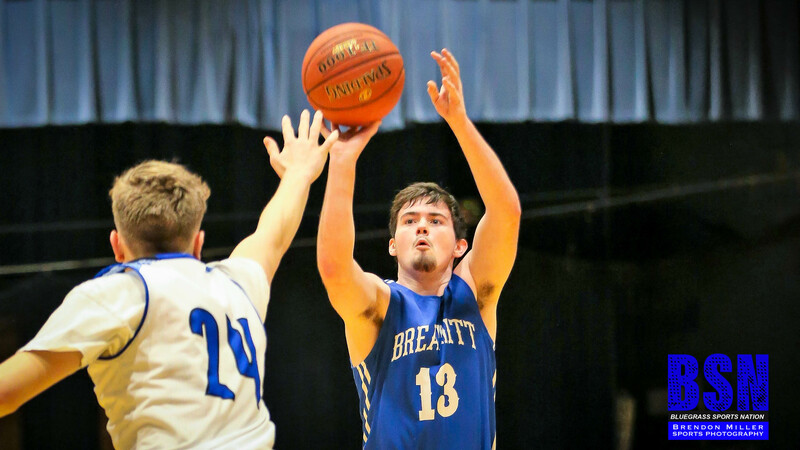 Entering tonight’s contest, Breathitt is playing their best basketball of the season going seven and one in their last eight games, and winning their last four. Wolfe is starting to peak as the Wolves are 2-1 in the last 3 games. 1st Quarter- Breathitt won the tip and the track meet was on. Breathitt’s Kyle Fraley lit up Rose Gymnasium by connecting on two early three pointers. Jalen Taulbee of the Bobcats also opened with a hot hand adding to the three point barrage. Breathitt opened with a 9-4 lead. Wolfe County countered with Sophomore Guard Jaz Johnson with slashing drives and threes. Wolfe County was able to slow down the Bobcats three-point shooters and take a one- point lead with 2:11 remaining in the quarter, at 20-19. Breathitt’s Fraley continued his impressive shooting connecting on two more threes, giving him his fourth made three of the quarter. End of the First, Breathitt 29 – 23. 2nd Quarter- Wolfe opened the second quarter with a seven to one run, with stellar play from Johnson and nifty passes from Point Guard Wilgus Tolson. The tempo continued to increase with both fan bases on their feet. Breathitt then cooled down for a few minutes of the quarter and Wolfe built its lead to seven points leading 42-35 with 1:48 remaining in the half. Breathitt’s Jack Fugate the heated up from three-land, and the Bobcats started to force the Wolves into turnovers cutting and cut the lead to two points with under a minute left in the half. Breathitt scores late in the quarter tying the game at 42 entering intermission. 3rd Quarter- Breathitt opened the second half with a 7-0 run leading Wolfe County 49-42 with 6:18 remaining in the quarter. Wolfe the quickly responded with an 8-0 run of its own, to take the lead 50 – 49. Out of a timeout, Breathitt heated up again with threes from Fugate and Fraley, to build the lead back up to eight, at 61-53 with 1:08 remaining in the quarter. Breathitt then hit the gas with another eight unanswered to build the lead to as high as 16. End of the third, Breathitt 70-56. The Bobcats outscored the Wolves 28-14 in the Quarter. 4th Quarter- Wolfe continued to press and hustle in the fourth quarter, trying to cut into the Bobcat double digit margin. The Bobcats held the margin with Fraley knocking down his sixth three of the night to tie the Bobcat single game record, end extend the lead to 80-62 with 5:44 remaining in the game. Wolfe made a 6-0 run but were not able to cut the deficit to single digits. Final – Breathitt 98-Wolfe 86. Breathitt County improves on the season to 12-6, and finishes 55th District play undefeated at 4-0. The win was the storied Breathitt programs’ 1800th all time win. Breathitt County’s back court of Jack Fugate, Jalen Taulbee and Kyle Fraley combined for 76 of Breathitt’s 98. Fraley lead all scorers with 29 points with his six made three’s. Jalen Taulbee finished with 28 points and Jack Fugate added 19. The win tonight secured Breathitt a first round bye in the 55th District Tournament which automatically puts Breathitt County into the 14th Regional Basketball Tournament. Wolfe County drops on the season to 6-12, and is also finished with 55th District play at 2-2. Wolfe will take on Jackson City in the semi-finals of the upcoming 55th District tournament. Wilgus Tolson and Jaz Johnson are two phenomenal players and are the leaders of the team. Both are Sophomores, and along with Freshman Sawyer Thompson, the future of Wolfe Basketball looks bright. Johnson poured in 28 points and Sawyer Thompson contributed 17, and Tolson scored 12. 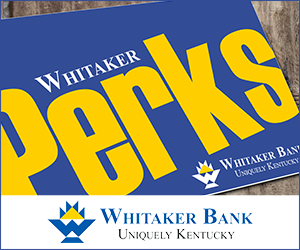 Thanks to our Game Sponsors of the Breathitt-Wolfe Game: Whitaker Bank of Campton and Wolfe County Farm Bureau, (Susan Cable and Roy Kelley, Agents) on the Wolfe side and First National Bank of Jackson and Variety Pizza on the Breathitt side. Let them all know you appreciate their support of our Wolfe and Breathitt young people!!!!! 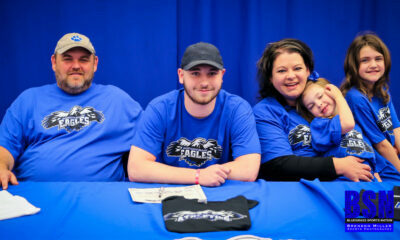 Full photo by Brendon Miller below in separate post here on web and on our Bluegrass Sports Nation Facebook Page!!! !